How do we know that we live in the future? 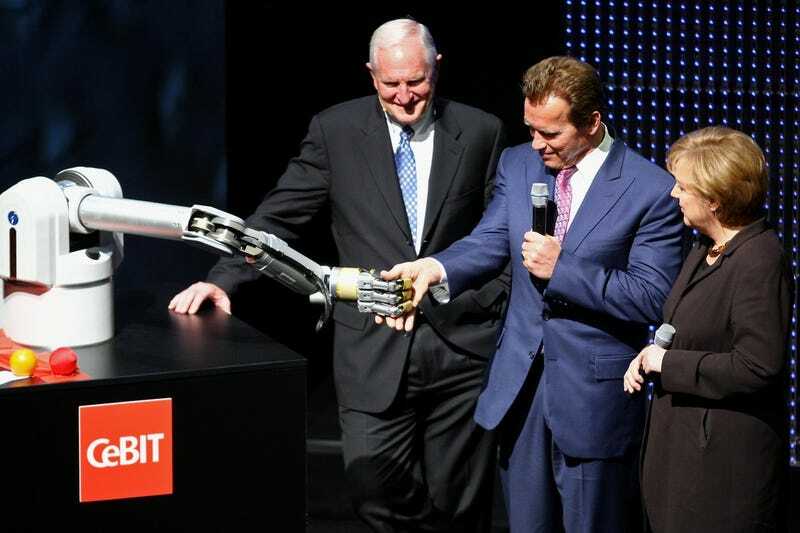 Politicians are shaking hands with robots. Like a lot. The practice may seem silly, but new research shows that shaking hands with a robot can actually be useful for building trust during business negotiations — provided the robot is controlled by a human negotiator. A new study from researchers at the University of Bath set up simulated negotiations for a real estate deal. Since human touch is a crucial element for establishing trust, they wanted to know if any of that trust was lost during telepresence business meetings. The study seems to suggest that we don’t lose any trust, as long as the meeting starts with a robotic handshake. Study participants were first placed in two different rooms and asked to shake hands via a telepresence robot. One person shook a robot’s hand, while the person in another room controlled the robot’s arm movements via a Nintendo Wiimote. Researchers found that the participants didn’t rate their negotiating counterpart as any less trustworthy than if they had been actually shaking hands in the same room. “Despite the fact that the non tele-present negotiator could not see the real face of their counterpart, tele-presence did not affect the degree to which negotiators considered one another to be trustworthy, nor did it affect the degree to which negotiators self-reported as intentionally misleading one another,” the study found.